lay:art style natural hair brushes provide premium quality for the highest demands. An innovative manufacturing technique achieves maximum values in terms of tension, dimensional stability and durability of the brush tip. The ergonomic handle design with Soft Touch is optimally balanced and fits very well in the hand. Top quality with natural hair for consistent working comfort at the highest level. 10 sizes with different shape concepts, perfectly coordinated to individual requirements. The Big Brush technique with sizes 8, 6 and 4 increases the moisture reserve and tension. Size 2 for small amounts, opaque brush for uniform application and staining brush for subtle shade accents – available as a practical set or individually. Size 2 is ideal for the exact application of small amounts. The perfect combination of thick and long hairs (7.5 mm /0.29″). It nestles on the framework surface and ensures an effective, uniform opaque and liner application. The staining brush: High strength right into the tip for targeted application of perfect shade accents and specific details. We have developed this ergonomic system in close collaboration with numerous experts from the porcelain sector: for more efficiency, reliability and pleasure while building up porcelain. 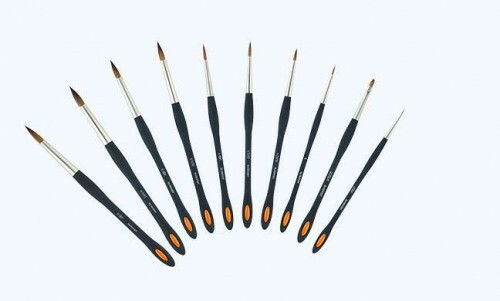 lay:art style sets new standards in three areas of the brush technique. With the lay:art style Premium quality is produced by an additional selection process using only the absolutely best hair. The result is an extremely stable brush tip, which becomes more pointed rather than blunt due to wear. And a strong hair bond, which significantly reduces the build-up of porcelain particles. The ergonomic handle form with Soft Touch is very light and balanced for improved handling. The integrated rollaway protection (in four colors) allows for customization.